"You Hacked, ALL Data Encrypted. Contact For Key(cryptom27@yandex.com)ID:681 ,Enter." MUNI Spokesman Paul Rose said his agency was investigating the matter and "working to resolve the situation," but did not provide details as of how MUNI got hacked. "We are currently working to resolve the situation," said Rose. "There is an ongoing investigation, and it wouldn’t be appropriate to provide additional details." It is yet not clear exactly who was responsible for the attack (besides a pseudonym "Andy Saolis"), but according to local media reports, the agency’s computers were being held by ransomware until the MUNI paid the equivalent of more than $73,000 in Bitcoin. "We don’t attention to interview and propagate news! Our software working completely automatically and we don’t have targeted attack to anywhere! SFMTA network was Very Open and 2000 Server/PC infected by software! So we are waiting for contact any responsible person in SFMTA but I think they don’t want deal ! so we close this email tomorrow!" 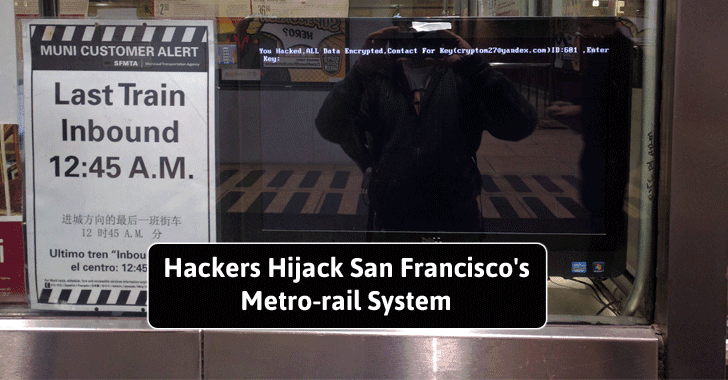 The hacker provided hoodline a list of systems the hacker claimed to have infected in Muni’s network, which came out to be 2,112 of the total 8,656 computer networks. The hacker also said that the MUNI had "one more day" to make a deal.